Other styles of gutters have been used over the many years of home and building construction, but today the most common are the half-round gutters and the K-style gutters. The half-round are more common in older construction, and since the 1960’s the K-style are the most common. Both have advantages and disadvantages. Newer fabrication technologies have made both affordable. 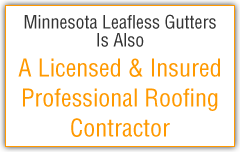 Minnesota Leafless Gutters customizes both seamless gutter styles on site to perfectly fit your home or building. Finding the style, appropriate size, and perfect color that matches, blends or compliments your home’s color and personality has become an easy process. Selecting gutters that fit within your budget has also been made easy due to the fact that gutters are made from different types of materials. Over the years gutters have been made from vinyl, aluminum, steel, copper, and even wood! At Minnesota Leafless Gutters we specialize in gutters and downspouts made from enduring materials appropriate for the extreme Minnesota weather. We use the heaviest gauge metal in the industry—for both residential and commercial. We do not install vinyl as its lifespan is limited in the cold temperatures of a Minnesota winter. Have your roof and leafless gutters completed at the same time, by the same reputable company!